In 1993, Steven Spielberg gave us the greatest cartoon ever made. It was the funniest ever made show for children's of all ages. Animaniacs was born out of a small project that Spielberg gave to Warner Brothers and all of the sudden, Yakko, Wakko and Dot became to be what we known as "The Warner Brothers and their Sister." 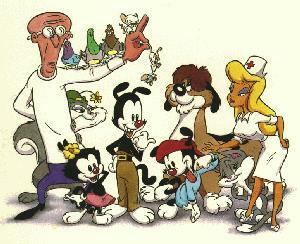 The Save Animaniacs Campaign was created as an inspiration to all fans of the cartoon to join forces, after learning out that Warner Brothers was ending the show with no exact reason, while the show was enjoying success. Yet we all know that the decision of moving the Emmy Award series from FOX Television to the new KIDS WB was simply labeled as a failure in ratings. A failure that led corporate officials to the fateful ending of all the Warner Brothers animated series, like Animaniacs, Pinky & The Brain, Earthworm Jim, Road Rovers, Tiny Toons Adventures and several other projects that KIDS WB was aiming to do. During the last 5 years, Save Animaniacs Campaign has made efforts to promote the cartoon Animaniacs to all the masses across the globe and let them know that Animaniacs still deserves to be one of the greatest cartoons ever made. Regardless the decision of not continuing the animated series, we will continue educating the fans until we see Animaniacs back on TV with new episodes. If you think that I will fail as The Brain in this effort? I will send Slappy to get you an ANVIL in your head! 10 Years Later...Who's 'The Brain' behind this? This web site is maintained by Carol Alfonso, a Puerto Rican fan of Animaniacs and other cartoons too (Likely I would talk "Pokemon"). Currently, living in Seattle WA (USA) and started this project back in 1998, in Orlando FL, in an effort to request "Warner Brothers" to continue production of "Animaniacs". Although the efforts are diminished, I still believe that "Animaniacs" would eventually have a place to be considered for a new cartoon. Just come back often, the Save Animaniacs Campaign is available 24/7 for your entertainment. About the Banners and "Pop Up" Ads from Tripod, I don't control those, cause they want me to pay the fees in order to get rid of those! Sorry Pinky! This is how they get their money and this is why I don't pay for this site! If you like you can use a pop up blocker, but the ads in this page will not be gone. The issue of Browsers: This web site has no problem in being seen by your PC's browser. Most computers will have Internet Explorer (Microsoft). It is also compatible with all browsers, like Netscape or "Mozilla" type of browsers. Also can be seen on the "Internet TV" type (MSN TV or WEB TV) service. The web site may ask for a small plug known as JAVA. If your PC is not able to read it, is because it does not support the JAVA plug in. If you find any of the pages, being unable to download correctly, please let me know, by clicking on the Contact Information Display below! ANIMANIACS are copyright Amblin Entertainment/Warner Brothers Television Animation.